You have just found or created the perfect dress for the perfect occasion but you need something more to make it stand out and become that one of a kind dress that will WOW everyone who sees you. Applique Collars offer you that opportunity. Perhaps you already have a terrific dress that just needs to be freshened up a bit. You can achieve that by selecting a dramatic eye stopping collar that accentuates your dress and highlights your ensemble. 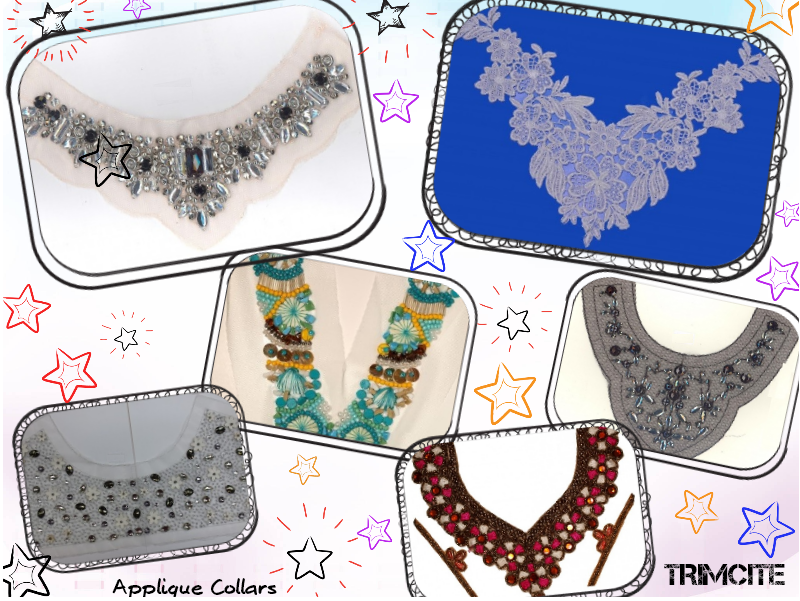 We offer hundreds of options that enable you to find the ideal collar for your dress or blouse. Is it a V-neckline you need? You can choose between layered collars, those with sequins and mesh or maybe bows or beads. Metallic collars are certainly eye-catching and we have a lovely selection. You can also see we have round necklines with intricate beading and lace, or some with chiffon, flowers and mesh. You prefer a square neckline or another type of unique shape? Again, no problem. If you are looking to impress we will help you with the just the right fashion statement. Necklines are still low these days and we bring you choices that allow you to follow those fashion trends. If you prefer a higher neckline intending to draw attention to and highlight the beauty of your eyes or draw attention to your clavicle, you will certainly find many opportunities to accentuate those areas as well. We have been in the same location since 1992 and while we provide service for both wholesale and retails clients our motto has never changed. That highly help motto is to provide customer satisfaction to each customer. Please contact us to experience our variety of products and our commitment to excellence.